(CNN) — After a couple of hours standing in the stairwell of a bus, staring out a foggy window at the blue predawn Pampas streaming by, I start to compile the lessons I’ve learned about long-haul bus travel. I’m standing up because this bus filled up somewhere in the middle of Argentina, and my ticket is for a seat No. 9 on a bus that has no seat No. 9. I’m on this bus because I missed the Mendoza-to-Buenos Aires bus I bought a ticket for. All this because I was planning in the wrong time zone. Pay attention to when you depart, and be aware of the local time. I arrived at the Mendoza bus station about 10 minutes after my original bus left, which I thought was 50 minutes early. Pay attention to when your bus arrives at your destination, especially if you are headed somewhere new. You don’t want to get into a strange city in the middle of the night. It is less safe, harder to navigate, and services like the metro may be unavailable. 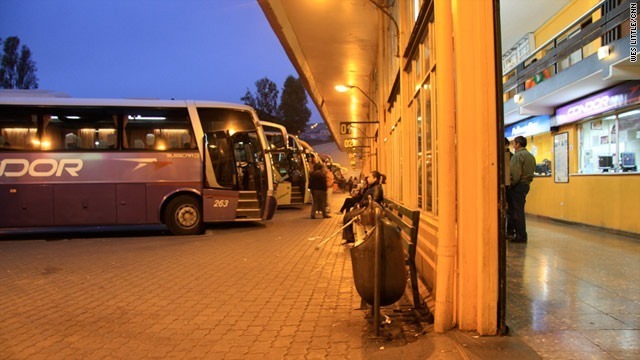 Buses from Chile wait to go through customs at an Argentine border outpost. Have your documents in order. Crossing national borders by bus can happen one of two ways: You’ll either take the same bus, or you’ll have to change. If it’s the former, the bus stops and lets all the passengers off to go though customs and get stamped; the bus is checked, and then you get back on. In the latter case, you’re dropped off by one bus, go through customs and board another bus on the other side of the border. The catch here is that there actually needs to be another bus on the other side. I once took a bus from Tel Aviv, Israel, to Cairo, Egypt, and after we passed through Egyptian customs, there was no bus. The company rep negotiated with local drivers and eventually secured transportation to Cairo, hours later. Speaking the local language is a big advantage, but if you don’t, arrive extra early and triple check when your bus is supposed to arrive and where it’s supposed to be. Bus stations simply don’t often have the information displays that train stations and airports offer. If you think a bus might be your bus but it doesn’t come to the platform you expect, just show your ticket and try to get on. The conductor won’t let you on if it’s the wrong bus, but if your bus is at a different platform, nobody is going to come find you and ask you to get on the bus. Consider the view. Interesting terrain is much more enjoyable than an endless flat expanse. The ride from the Chilean coast through the Andes to Mendoza, Argentina, is beautiful. The ride from Mendoza to Buenos Aires is grindingly monotonous. The flip side is that accidents are more likely to occur on mountain roads, which may be a concern in less developed countries with poor infrastructure. There might be movie service, but that doesn’t mean it’s good. Horrible, violent “B” movies may be played over the speakers. Think about packing earplugs. Why deal with the bus at all? I like to cover a lot of territory on international trips, often booking open-jaw flights. Also being something of a budget traveler, I don’t usually fly between destinations within a trip. I love boats and trains, if they’re available. But outside of Europe and a few other places with advanced rail — east Asia in particular — I usually end up on the bus. In South America, buses are a primary means of intercity travel, and many companies compete for business, offering a range of classes of service. Some luxury buses have cubicles with what look like giant recliners with personal entertainment centers and multiple meal services. The majority of buses are divided by “cama” (bed) and “semi-cama” status. If you can sleep on a plane, semi-cama will be good enough for you because these seats recline more and are more comfortable than most coach airline seats. Bring patience and a positive outlook. Bus travel often carries more risk of hassle and takes longer, but you’ll save money, and a bus trip is usually more of an adventure than a flight between the same points.